A new study led by UC Riverside astronomers casts light on how young, hot stars ionize oxygen in the early Universe and its effects on the evolution of galaxies through time. A galaxy can be thought of as a factory that produces stars from cold gas, with some galaxies being more productive than others. Therefore, what roughly defines the evolutionary parameters of a galaxy is the rate of star formation, stellar mass, and gas content. We currently know that the rate at which stars form (star formation rate) in galaxies has not always been the same throughout the Universe’s history. In fact, the typical star formation rate in galaxies rose for the first 2 – 3 billion years after the Big Bang and has been steadily decreasing for the past 10 – 11 billion years. In other words, the Universe is truly in a production crisis as galaxies are becoming less active in creating new stars. Because cold gas is the fuel of star formation, it is imperative to understand how the physical conditions of the gas are changing throughout the Universe’s history. “One way to study the conditions of gas in star-forming regions of galaxies is to observe the spectral emission lines,” said lead author Ali Ahmad Khostovan, a graduate student at the Department of Physics and Astronomy, UC Riverside. “These lines are produced when light from bright, massive, short-lived stars interact with the surrounding medium resulting in regions where atoms are broken up (ionized).” The emission lines are only visible while the most massive stars shine, therefor the timescales traced by these lines are dependent on the lifespan of these stars (~10 – 50 million years). Therefore, emission lines can be used to trace the instantaneous activity and conditions in star-forming regions of galaxies. In a study recently accepted for publication, the authors used a sample of emission-line selected galaxies from the High-z Emission-Line Survey (HiZELS) to trace the evolution in the strengths of emission lines associated with singly-ionized ([OII]) and doubly-ionized oxygen ([OIII]). The importance of these two lines is that they provide information regarding the energetic excitation (ionized) state of the gas since the main difference between the two lines is the energy needed to go from singly- to doubly-ionized oxygen. The way this is accomplished is based on the unique design of HiZELS. The survey uses 4 narrowband filters, one installed on the Subaru Telescope and the other three on the United Kingdom InfraRed Telescope (UKIRT). These filters are narrow enough that the light from an emission line would dominate the detector of the telescope. As emission lines are narrow and redshifted, they act as testifiers of four different time slices (one for each filter) of the Universe’s history. The authors also used a wealth of ancillary data from various ground-based telescopes such as the Canada-France-Hawaii Telescope (CFHT) as well as space-based telescopes such as the Spitzer Space Telescope. Their samples also includes spectroscopic follow-up using the DEIMOS and MOSFIRE spectrographs on the W. M. Keck Observatory, and spectroscopy from other studies. 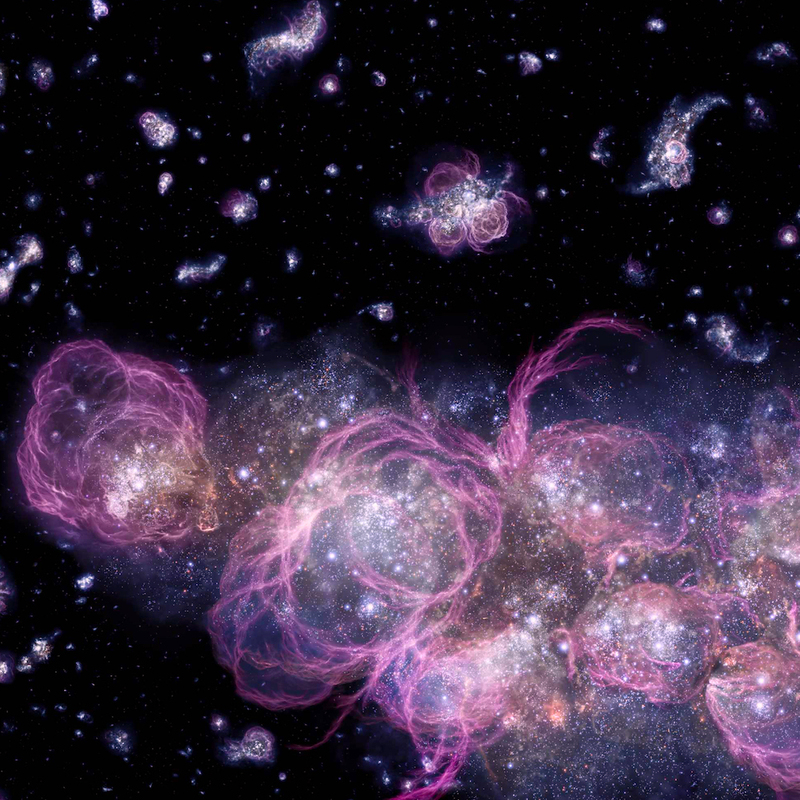 The study is comprised of 7,000 selected galaxies. The study presents the first measurements of the changing strengths of oxygen emission-lines from the present-day and up to 12.5 billion years ago. The main conclusions of this study is that the strength of doubly-ionized oxygen increases going back in time, while the strength of singly-ionized oxygen increases up to 11 billion years ago and then decreases for the remaining 1 – 2 billion years. The cause of the two different evolutions is due to the changing physical conditions inside star-forming galaxies where the amount of ionizing energy inputted into the gas by newly formed stars is much higher in the early Universe. The results of this paper helps to set the framework for future surveys using the next-generation telescopes, such as the upcoming James Webb Space Telescope (JWST), that will allow for us to study the conditions inside star-forming galaxies even further into the past to the era of the first galaxies. This paper has been published in the Monthly Notices of the Royal Astronomical Society and includes collaborations from US and UK institutions. The paper was co-authored by David Sobral [Lancaster University], Bahram Mobasher [UC Riverside], Ian Smail [Durham University], Behnam Darvish [Caltech], Hooshang Nayyeri [UC Irvine], Shoubaneh Hemmati [IPAC/Caltech], and John Stott [Oxford University]. The research paper can be found in the the MNRAS Journal.